27 Nov 2017 --- Children and adolescents in the US who do not drink tap water, which is typically fluoridated, are much more likely to have tooth decay, according to a new study in the American Journal of Preventive Medicine. However, the study also confirms that those who drink tap water are more likely to have elevated levels of lead in their blood. Public awareness of the hazards of lead-contaminated water in the US has increased since 2014 when concerns were raised after the drinking water source for Flint, Michigan was changed to the untreated Flint River. A federal state of emergency was declared and Flint residents were instructed to use only bottled or filtered water for drinking, cooking, cleaning and bathing. Even before the Flint water crisis, there was public mistrust of tap water safety. But avoiding fluoridated tap water raises another public health concern, the Elsevier press release notes: children are denied its protection from tooth decay. According to the Centers for Disease Control and Prevention (CDC), adding fluoride to the water supply has dramatically reduced the prevalence of tooth decay in the US over the past 70 years. However, tooth decay is still a widespread issue. From 2011 to 2012, it affected the primary teeth of 23 percent of US preschoolers. A nationally representative sample of nearly 16,000 children and adolescents aged 2 to 19 who participated in the National Health and Nutrition Examination Survey (NHANES) from 2005 to 2014 was analyzed by Anne E. Sanders, Ph.D., and Gary D. Slade, Ph.D., of the Department of Dental Ecology, University of North Carolina at Chapel Hill. More than 12,000 records examined included data on blood lead level and about 5,600 had dental caries examination data. NHANES is the US benchmark for national surveillance of blood lead levels and is the sole national source of dental examination data. Following an in-home interview, participants visited a mobile examination center where they donated a blood sample, completed a dietary interview and received a dental examination. About 15 percent of the children stated that they did not drink tap water. An elevated blood lead level was defined as having at least three micrograms of lead per deciliter of blood. Tooth decay was defined as the presence of one or more tooth surfaces affected by dental caries as determined by dental examiners using a standardized protocol. 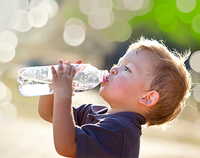 According to the results of this study, children and adolescents who did not drink tap water were more likely than tap water drinkers to have tooth decay but were less likely to have elevated blood lead levels. Those who drank tap water had significantly higher prevalence of elevated blood lead levels than children who did not drink tap water. Overall, nearly 3 percent of children and adolescents had elevated blood lead levels and 49.8 percent had tooth decay. Among American children and adolescents, one in five living below the federal poverty level, one in four African Americans and one in three Mexican Americans do not drink tap water, vastly exceeding the one in twelve non-Hispanic white children who do not. The statistical analysis also took into account other factors that could account for the relationship between non-consumption of tap water and blood lead levels and tooth decay, Elsevier notes. A limitation of the study was that the fluoridation status of participants' tap water was unknown, so the observation that drinking tap water protects against tooth decay may be an underestimate of fluoride's protective effect.